With these two brand-new MAN TGX tractors joining their fleet, AJT Recycling has certainly ‘raised their game’. Catering for both the individual and larger companies throughout Swansea and the surrounding areas, AJT’s metal recycling business has grown thanks to their hard work ethic combined with great customer service. The latest trucks to join the AJT fleet are simply outstanding; these award-winning MAN TGX 26.640 trucks are amongst the most powerful trucks currently on the roads of South Wales. 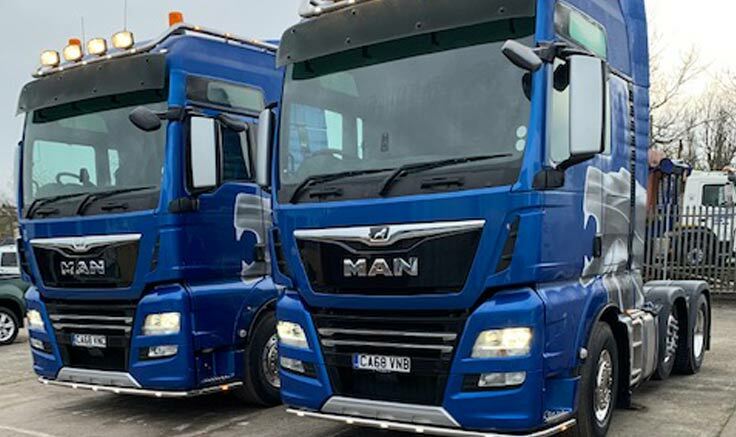 The MAN brand is synonymous with high powered trucks that are proven at working efficiently across a range of demanding commercial vehicle operations. Supplied by MAN’s number one franchised dealership in South Wales: W.G. Davies at Swansea, these two head turning units will soon be seen working around the roads of Swansea. “Understanding the needs of companies such as AJT is key to supporting a successful business when it comes to their transport needs,” says Roger Davies, Managing Director of W.G. Davies. Swansea based K & M Transport have taken delivery of two new MAN tractor units from our W G Davies dealership.